There is a common belief that one on one private lessons are better than group lessons. This is based on the idea that teaching several students at one time means each student gets less attention. Such logic is not based on evidence but is instead, just assumed. The fact is the evidence as I discovered, is quite to the contrary. In the late 90’s, I started experimenting, firstly with adult groups and later groups of children. It wasn’t easy for me as a teacher because I was out of my comfort zone. I was used to private teaching so it took some time to learn. Initially my group teaching was quite poor, so I did a lot of research and attended seminars to learn how to engage groups successfully. It didn’t take long before the obvious advantages to group learning were revealed. I have since come across several studies done on ‘collaborative learning‘ that prove, people learn better in small groups compared to private lessons. We are a social species and collaborative learning is one of our main advantages. So here are 3 reasons why you will want to choose group learning over private lessons. 1. Did You Know Social Proof Is Powerful Motivator? The term social proof refers to the way we look to others for cues on how we should and should not behave. We like to believe we make all our own decisions but this unfortunately (or fortunately) is not true. One study in the US showed that obesity is actually contagious, spreading like a virus and has been gradually expanding out through the population since the 1980’s. If your closest friend or partner is obese there is a 57% chance you will also become obese. The researchers say that we are strongly influenced by the behavior of people around us. If those whom we associate with overeat the odds go up that we will too. This is especially true of people we see, as being like us. While this may be a disturbing finding you can use this information to your advantage to learn guitar. The teacher may be the most knowledgable person in the room but your classmates also have much to teach you. Studies conducted at Princeton Review show that we actually learn best in small groups. Large groups of more than 7 tend to become less effective. The ‘one to one’ lessons lack the social element that group learning brings and therefore misses out on the benefits. Groups of 5 to 7 are big enough for to benefit from group learning but small enough to work as an effective team. When we work together in small groups we are able to see how other students overcome challenges and adopt those ideas or even expand on them. The group dynamic has a certain energy about it which you don’t get from private lessons. Its like there is less pressure because you are not the only one attempting to learn guitar. Guitar takes patience and persistence but in a group environment it just feels easier. Students I found took themselves less seriously and were able to show empathy toward each other. There was always someone in every group who knew how to make everyone else laugh and have fun. Groups help to bring the balance we all need when facing any challenge. Should we forget about private lessons? Private lessons do have their place and group teaching does require a skilled teacher but, in my experience the results exceed private learning in most cases. 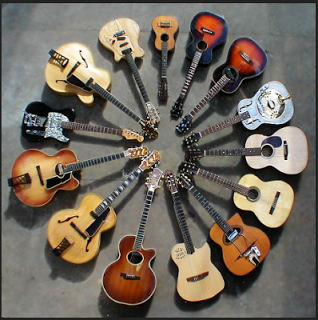 I believe (based on 30 years experience) that the superior way to learn guitar is in small groups supplemented by private lessons if required. Students who learn exclusively in private lessons are in my opinion at a disadvantage. At the very least students should form a peer group to share ideas, jam and generally motivate each other. Previous Post Why do the most successful guitar students expect to fail?